After fifteen years of nurturing some of the most authentic and fresh voices in Canadian writing, the HSW Literary Agency will close upon the retirement of principal agent Margaret Hart. Margaret has spent a lifetime working with books and is looking forward to beginning this new chapter. While the HSW Literary Agency is no longer representing clients, we are particularly proud of our affiliation with the acclaimed Humber School for Writers and of supporting the development of graduate work. The Humber School for Writers remains alive and well and will gladly recommend its graduates’ manuscripts to agents across this country, as well as to help promote graduate work once it has been published. We thank our clients for the honour of representing their books and continue to wish them every success with their writing. Almost two years after publishing her exposé of maternal health care in the developing world, Dr. Gretchen Roedde continues to be an in-demand speaker with professional associations and non-governmental organizations alike. Up next for the Doctor’s Quest author? June engagements in Sudbury and Toronto. What: A dinner with Dr. Gretchen Roedde and the Sudbury chapter of the Canadian Federation of University Women. When: Monday, June 2, 2014 at 6:00 p.m.
Where: Bryston’s on the Park, 5 Creighton Rd, Copper Cliff, ON. How: Contact CFUW Sudbury for more information. What: Dr. Gretchen Roedde speaks at the annual luncheon of the 1974 alumni of the Quo Vadis School of Nursing. When: Saturday, June 14, 2014. Where: The Old Spaghetti Factory, 54 The Esplanade, Toronto, ON. Last fall, Alison Lohans quietly self-published the picture book Leaving Mr. Humphries. Now, the book is poised to receive a whole lot more attention: it’s been nominated for a 2014 High Plains Book Award in the children’s literature category. We join Alison in eagerly anticipating the award announcement during the High Plains Book Awards festival, which is scheduled for the weekend of October 24, 2014. This new accolade follows a recent Saskatchewan Book Award shortlisting for the picture book. When Josh goes to stay with his aunt and grandfather one summer, he has only his teddy bear, Mr. Humphries, to remind him of home. He finds comfort in his stuffed companion, taking him everywhere until one day, Mr. Humphries is no longer there. Told in Lohans’ “crisp and descriptive” prose and ably illustrated by Gretchen Ehrsam, Leaving Mr. Humphries is the gentle, resonant story of a young boy finding his self-confidence as he leaves childhood behind. The life of an author, quietly perfecting her craft, is often anonymous. But the efforts of crime writer Kristina Stanley are at last getting the attention they deserve: Stanley has three works up for separate crime writing awards! Descent, the first book in Stanley’s Kalin Thompson series, is nominated for the Unhanged Arthur, the Arthur Ellis Award recognizing the year’s most promising piece of unpublished crime fiction. Over in the UK, the Crime Writers’ Association honours book two in the series, Burnt, with a nomination for their Debut Dagger. Finally, just in time for Short Story Month, Stanley’s “When a Friendship Fails” is nominated for the Capital Crime Writers‘ Audrey Jessup Short Story Award. Congratulations, Kristina! We anxiously await the results! Toronto summers are full of book events that city literature lovers are loath to miss. The latest must-attend reading to add to the calendar is July’s edition of the Brockton Writers Series, headlined by Tamai Kobayashi, author of the acclaimed Prairie Ostrich (Goose Lane Editions, 2014). What: Tamai Kobayashi reads at the Brockton Writers Series. When: Wednesday, July 9, 2014 at 7:00 p.m.
Where: full of beans Coffee House & Roastery, 1348 Dundas St West Toronto, Ontario. How: Pay what you can. Books and treats will be available for sale. For further details, contact the Brockton Writers Series. The best fiction transports you to another time and place. Spanning from Japanese-occupied Taiwan to present-day Canada, the stories in Julia Lin‘s Miah do just that. Now readers can add to the experience by pairing the stories with a tour of the University of British Columbia’s Chung Collection. During UBC’s Alumni Weekend, book lovers and history buffs alike are invited to hear Julia Lin read before exploring the library’s collection of early Chinese-Canadian history. All are welcome to the reading, but space in the tour is limited. What: Julia Lin reads at the University of British Columbia alumni weekend. When: Saturday, May 24, 2014 at 2:30 p.m.
Where: Irving K. Barber Learning Centre (Victoria Learning Theatre), 1961 East Mall, University of British Columbia, Vancouver, BC. How: The reading is scheduled for 30 minutes. A 30-minute tour of the UBC library’s Chung Collection will follow. Space for the tour is limited to only the first 30 people. May is International Short Story Month, and for lovers of the form like us, that’s cause for celebrations! Celebrations like the standing room-only Toronto launch of one of the smartest collections of the season, Anna Leventhal‘s Sweet Affliction, or like the book’s Winnipeg launch tonight. Or like Julia Lin‘s upcoming Vancouver reading from the sensitive, thought-provoking Miah, a linked collection exploring the lives of the Taiwanese and Taiwanese-Canadians. Still not sure where to start? The Literary Press Group is offering an exclusive ebook sampler of Canadian short fiction, Full of Lit 2014: An Anthology of Short Stories from the Publishers of the LPG, for only $5.99. Including a short story from Anna Leventhal’s Sweet Affliction, the book is a great introduction to some of the form’s most interesting new voices. 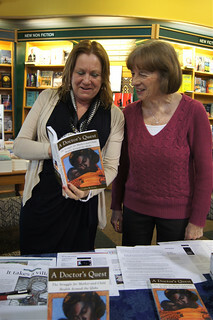 It takes a special type of person to brave a Prairie winter, which explains why the intrepid Dr. Gretchen Roedde, author of A Doctor’s Quest: The Struggle for Mother and Child Health Around the Globe (Dundurn Press, 2012), travelled to Saskatoon during the first week of March. As a guest of the Saskatoon chapter of Grandmothers for Grandmothers, Dr. Roedde spent the afternoon signing books and chatting with readers at McNally Robinson before delivering the keynote speech at G4G Saskatoon’s annual fundraising dinner. Sharing stories from the trenches of mother-and-child health care in the developing world, Dr. Roedde addressed 400 people gathered at the Western Development Museum in support of the Stephen Lewis Foundation‘s work with African grandmothers caring for AIDS orphans. They say the book tour is a thing of the past, but tell that to Anna Leventhal. First feted in her adopted home of Montreal, Sweet Affliction (Invisible Publishing, 2014), Leventhal’s debut collection of expertly crafted stories, is slated for a second launch this Saturday. Lucky Torontonians will be privy to both a reading by the author and a discussion with Leventhal and Pasha Malla, author of The Withdrawal Method and People Park. What: Anna Leventhal launches Sweet Affliction in Toronto. When: Saturday, May 3, 2014 at 7:00 p.m.
Where: Holy Oak Cafe, 1241 Bloor Street West, Toronto, Ontario. Published only two weeks ago, Sweet Affliction is already attracting attention of discerning readers. Cult MTL reviewer Shannon Tien observed that Leventhal’s stories “possess that authentic quality that confirms their previous existence in the archives of lived experience,” and praised the way the stories thwart our temptation to brand them “quirky.” Writing in the National Post‘s The Afterword, Sean Michaels provided a dust jacket-worthy assessment of Sweet Affliction: “These are serious, vivacious tales, punk-rock and clear-eyed: Karen Russell corkscrewed with Joan Didion, and as compulsive to read as a Michael Chabon novel at full gallop.” With buzz like this, is it any wonder that Sweet Affliction was one of Librarie Drawn & Quarterly’s Books of the Week for the week of April 17? Still not sure what to expect at a launch for a book as irreverent and incisive as Leventhal’s? 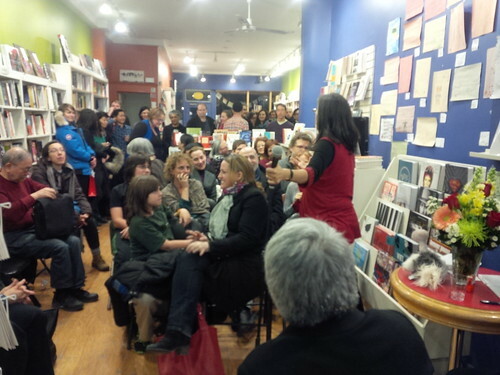 A play-by-play of the Montreal launch is up at the Librarie Drawn & Quarterly blog. Hope to see you on Saturday! 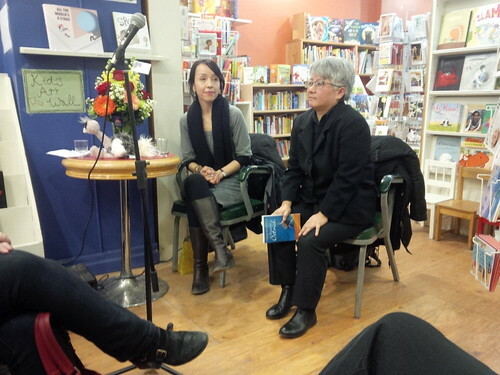 Tamai Kobayashi‘s first novel, Prairie Ostrich (Goose Lane Editions, 2014), was launched here in Toronto last month to much fanfare. The author was joined by fellow writer Kyo Maclear–who hosted the festivities at Another Story Book Shop–as Kobayashi fielded questions from the floor, which was standing room only. That the launch was well attended won’t come as a surprise to anyone following Canadian books. During the week of March 17, Kobayashi made a splash as guest editor of The Afterword, the National Post‘s book blog, posting on topics such as coping with trauma through storytelling, writing about children and animals, seeing–or not seeing–yourself in Canadian literature, and understanding history. At the same time, Prairie Ostrich was racking up positive reviews from critics and bloggers alike. NOW‘s Susan G. Cole included the novel in her list of must-read books, and in reviewing Prairie Ostrich for the National Post, poet and novelist Jennifer LoveGrove called it “an urgent and memorable, thought-provoking work.” At the Lesbrary, blogger Danika observed that Prairie Ostrich “makes you feel deeply for the people involved” and should “be absorbed slowly, letting all the subtlety of narrative sink in,” a sentiment echoed by Casey the Canadian Lesbrarian. Calling the book “mesmerizing,” Casey herself praised its “subtle, quiet power,” and advised not rushing through the prose. Indeed, Prairie Ostrich is a story to be fully savored; we at HSWLA are thrilled it has found an audience willing to do just that.